Long before Julie Taymor's critically acclaimed film Frida brought the compelling life of painter Frida Kahlo before the general public, local audiences were thrilled by Denver actress and playwright Melissa Lucero McCarl's Painted Bread, a powerful portrait of the artist in its own right. First performed at the Colorado Women's Playwright Festival in 1997, Painted Bread was restaged in August at the Theatre On Broadway. After an enthusiastic response, it returns for another summer run, this time with all the company's resources, allowing audiences to experience a fully realized production. While the play's story line, based largely on Kahlo's own emotion-packed writings, remains unchanged, four of the seven parts are recast. The direction and craft work are refined as well, resulting in a carryover of the best aspects of the previous staging, and a tighter overall presentation. The two biggest roles, Frida and her famed muralist husband Diego Rivera, are again played by Karen Slack and Jeffrey Atherton. Slack seemingly was born to play this role, having suffered a similar series of physical debilitations to that of Kahlo, who was crippled in a childhood bus accident and underwent dozens of operations that only compounded her pain. Every aspect of Slack's performance astounds. She gives us Kahlo from the playful yet determined adolescent and young woman, to the powerful, confident artist regaled by Picasso, Kandinsky and Rivera himself, to the broken, yet still light-filled visionary approaching death. Slack's accent work, a hefty combination of Mexican flavored with Frida's father's native German, remains consistent throughout, setting the tone for the rest of the ensemble's south-of-the-border patois. Exulting in the machismo of the larger-than-life Rivera, Atherton matches well with his irrepressible counterpart, providing himself the room to skillfully explore Rivera's conflicting appetites for painting, Frida, politics and other women. Edith Weiss meets the difficult challenge of the unnamed art museum guide, who begins her journey as an airhead unable to correctly pronounce Frida's last name and promulgating a cliché-ridden description of the artist's work, but develops into an introspective devotee of Frida and her art. This far-reaching transformation is made difficult to believe by the short shrift given to the interactions and dialogue used to illuminate the change, making Weiss' work that much more impressive. 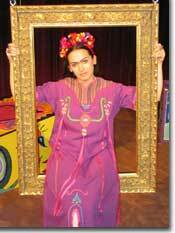 The tour guide and most of the other fictional characters in McCarl's story serve as a device for reciting facts and anecdotes about Frida's life. But with all due respect to the educational intent of this approach, in at least four scenes these dialogues seem forced, detracting from the powerful real-life conflicts between Frida and Diego, and weakening an otherwise strong script. The rest of the ensemble—Ricardo Salazar Vega, Daniel Langhoff, Evyan Strompolos and Jonathan Brown—provide excellent character work as well, particularly Vega's Garcia, Langhoff's Herr Kahlo, and Strompolos' Rita. Yet it is Slack's emotional investment in Kahlo, her visceral inhabitation of the very soul of the hobbled, yet outspoken, half German-Jew, half Mexican-Catholic communist painter, that overrides the piece's weaker elements and makes this must-see drama. The Theatre Group's presentation of Melissa Lucero McCarl's Painted Bread runs through August 28th. 303-777-3292.